The arrested Brooklyn ISIS guys were not a threat to the U.S.—or probably to anyone. 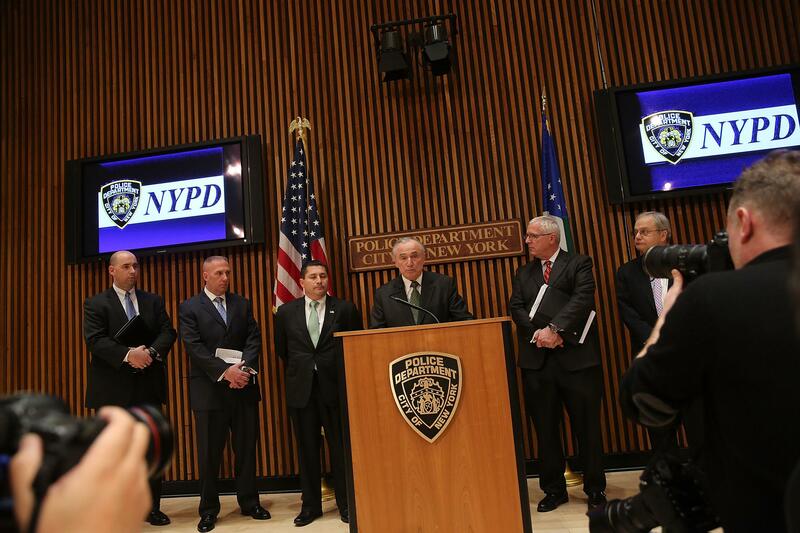 New York Police Commissioner Bill Bratton discusses the arrest of three Brooklyn men who allegedly plotted to travel to Syria to join ISIS, on Feb. 25, 2015, in New York City. The two men arrested in New York this week for attempting to travel to Syria to fight for ISIS might at first seem to be a confirmation of the warnings often voiced by politicians and law enforcement that the group poses a threat not just in the Middle East but to the U.S. homeland. These were, after all, young men radicalized through the Internet who expressed a desire to either travel to Syria to wage war or carry out attacks at home. But a Times story this week under the wonderful headline “Eager to Join ISIS, if Only His Mother Would Return His Passport,” is pretty reassuring about the actual level of threat the group poses to the U.S. The fact that this plot to wage holy war against the infidel depended on 19-year-old Akhror Saidakhmetov being able to sweet-talk his mom into giving him back his passport isn’t the only indication in the FBI’s case against the men, released just after their arrest, that we aren’t exactly dealing with future Bin Ladens here. The men first popped onto the FBI’s radar when Abdurasul Juraboev wrote a post on an Uzbek-language website last August saying that he wanted to shoot Barack Obama and asking whether he could swear his loyalty to ISIS in absentia. When the FBI paid a visit to him, he not only acknowledged writing the post and acknowledged a desire to fight for ISIS and kill Obama, he put it in writing and identified Saidakhmetov as someone who shared his ambitions. At that point, for the FBI, it was just a matter of waiting for them to develop the means and the plans—and helping them along in the process. While they got in touch with an ISIS recruiter who urged them to travel to the Islamic State, the men expressed frustration that since ISIS members “don’t know us, they won’t help us.” Most of the rest of the report concerns their attempts, along with a confidential informant posing as a fellow wannabe jihadist, to convince their families and U.S. authorities that they’re actually traveling to Uzbekistan. (At one point, Saidakhmetov got confused by all the code words and thought they actually were going to Uzbekistan, much to the amusement of his co-conspirators.) All the while, they seem to have been egged on by the informant, who also claimed to be able to forge crucial travel documents for them. This would appear to be the latest in a long line of cases in which not-so-bright guys with dreams of jihad are nudged along (in some cases borderline entrapped) by FBI informants. Other examples have included the guy who attempted to detonate a dud bomb given to him by the bureau outside the Federal Reserve, the guy who attempted to detonate a fake suicide vest outside the capital, and the guy who tried to blow up a fake bomb at a Christmas tree-lighting ceremony in Portland. All these men are serving lengthy prison sentences, though it’s not clear they would have gone as far as they had without the involvement of FBI informants posing as co-conspirators. This case is a bit different. For one thing, the role of the informant in facilitating the plan is less clear. For another, the plot in question was not an attack on U.S. soil, but an attempt to travel to fight overseas. The suspects discussed a number of possible attacks in the U.S., ranging from bombing Coney Island to joining the U.S. Army in order to shoot soldiers, but never got past the spitballing stage and probably didn’t have the means or knowhow to carry them out. However, assuming they could ever have gotten their act together to leave the country, Saidakhmetov and Juraboev could have posed a security threat—to the people of Iraq and Syria. The steady flow of foreign fighters to ISIS is the group’s main material advantage right now. Some foreign fighters, like Mohammed Emwazi, aka “Jihadi John,” do achieve the global notoriety potential recruits seek. The vast majority are thought to be used as front-line cannon fodder. Either way, ISIS couldn’t survive without them. But despite what seven out of 10 Americans believe, there’s not much evidence to suggest that ISIS poses a major security threat to the U.S. itself. No ISIS plots against America have become public yet, and the terrorist attacks in other Western countries carried out by ISIS sympathizers—including in Canada, Australia, and France—don’t appear to have been actually directed by the group, which compared with al-Qaida is more interested in expanding its territory than plotting elaborate attacks in the U.S. The Americans killed by ISIS have all been in the countries where it operates. It’s true that ISIS propaganda calls on its supporters to launch attacks, but it’s hardly the only group that does this. There was a risk of radicalized individuals carrying out terrorist attacks in the U.S. before ISIS emerged, and it will still be there even if the group is defeated. That’s not to say that ISIS—a marauding genocidal army terrifyingly destabilizing an already volatile region—isn’t worth defeating, or that the U.S. shouldn’t be involved in stopping it. ISIS is dangerous for the world, but for now, judging by its latest sorta recruits, it’s not that dangerous to America.